Let your Wi-Fi do the talking. By taking advantage of your public Wi-Fi hotspot you can increase social media engagement, boost your online exposure and collect useful information about your visitors and customers. You don’t need any technical knowledge. You just need Auki. Auki is a Wi-Fi based location analytics and engagement solution. 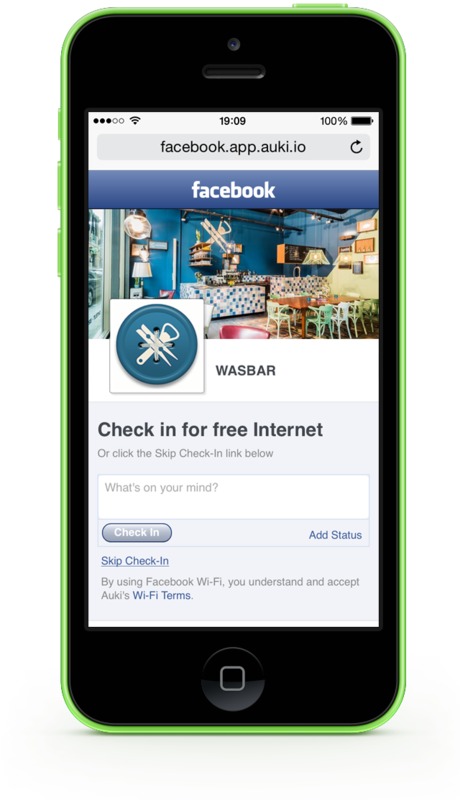 In simple terms, it uses Wi-Fi to tell you more about your visitors and allows you to get their attention. When a customer checks-in at your location it’s instantly shared with their friends, and a check-in also lets you know who’s visiting and allows you to connect. So, with Auki, you’re able to gain more impressions and social media data than from many other, more complicated products and platforms – and for a lower price, too. Type in the name of your Facebook page and enter your email address to see how it looks! Improving your online presence is a big part of Auki, but we’re even more interested in helping you understand your customers. Our analytics and statistics allow you to compare visitor trends after launching campaigns or running events, which means you can get a better impression of how effective your activities have been. Stay focused on your business while we use our powerful back end infrastructure to manage and monitor things for you. We use enterprise grade access points to deliver a stable and secure wireless network. Copyright Auki © 2019. All rights reserved.